An engine is a pump; to make that pump work more effectively you want to reduce restriction before and after the power plant. An aftermarket exhaust system is one of the best ways to do this. A cat-back system is a great first step but to realize an engines full potential exhaust headers are needed to complete the system. 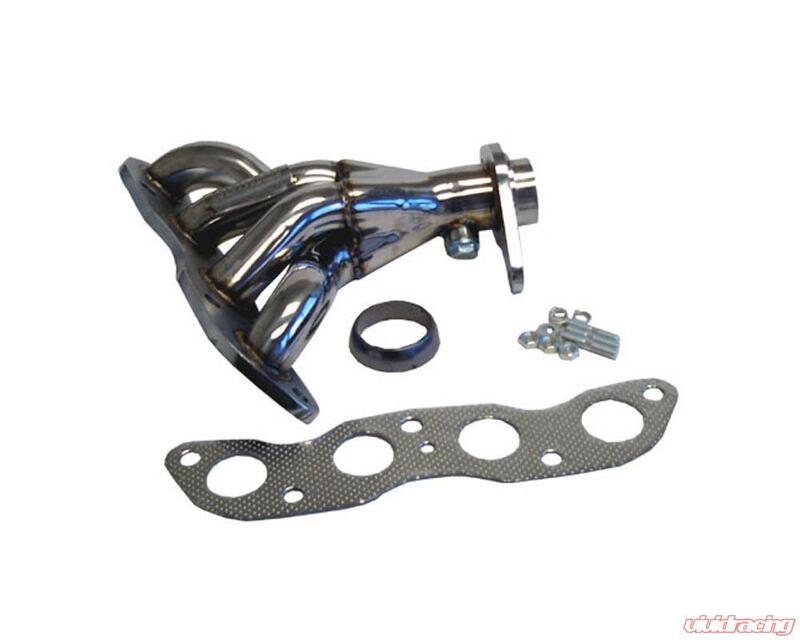 Headers bolt directly to the cylinder heads and direct the exhaust gasses individually before collecting before the catalytic converter. Megan headers are constructed from T-304 stainless steel, feature slightly larger primaries, mandrel bent tubing, and CNC machined flanges. Smooth mandrel bends increase the flow of the exhaust manifold and allow the engine to "breathe" more effectively thus increasing power. Megan???? ?_s headers also give your vehicle a deeper, more aggressive tone than the stock manifold. The new trend in performance Sport-Compact vehicles is to become lighter and lighter. The lighter the chassis, the better the power-to-weight ratio, and gains in power will be that much more noticeable. The Honda Fit is Honda???? ?_s answer to this new trend and is prevailing in the market. The Fit is fun to drive in stock form but the factory exhaust system can leave much to be desired in terms of sound and performance. Megan Racing???? ?_s exhaust headers offer a solution to both of these problems. Megan Racing???? ?_s headers increase both horsepower and torque for the driving enthusiast. The factory exhaust manifold is not made with optimal performance in mind. The increased exhaust flow will give your Fit a more aggressive tone that will set you apart from the pack. Their direct bolt-on design ensures a factory like fit and easy installation. Made of T-304 Stainless Steel with polished finish. Increases horsepower and torque from more airflow. Since its inception in 2001, Megan Racing Inc. has always stuck with the same goals and principles that have carried its name throughout the years. Megan Racing was founded on the belief that the goal of the automotive enthusiast should not be limited by the size of ones wallet, but rather on their heart and passion for motor-sports. The spirit of competition has been around for the last century and continues to live within each enthusiast today. That same spirit led the founder of Megan Racing to seek out a way of manufacturing quality performance parts while having them affordable for the grassroots enthusiast.